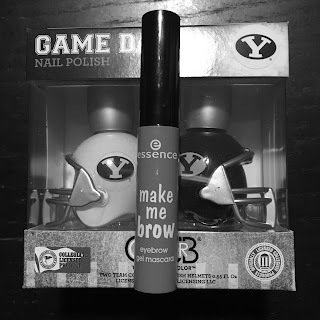 Earlier this week I told you a little about my plans for a beautiful BYU giveaway. I thought I'd preview a bit more of that tonight by telling you about one of my go-to products, which will be included in the giveaway. Bold brows have been in for a while now, and there's no shortage of ways to achieve the full, dramatic brows of your dreams. I have a couple of pencils that I love, and Benefit's powder and wax duo is great. But those products are expensive and, frankly, take a long time. So most days, I use brow gel. It's quick and cheap and still gives me a look I like. This eyebrow gel mascara has been my go-to for about a year now. At $2.99, you don't need to win the giveaway to give it a try, but it can't hurt! Remember, if you've provided your email address below, you'll receive two entries into the giveaway and you'll be the first to receive info about when the giveaway launches and what all is included. Full details here.